What's the best way to understand how special Little Flower is? Come for a Visit! learning about all the activities we have. requested or one we have chosen based on some of your interests and information you provide on our form. 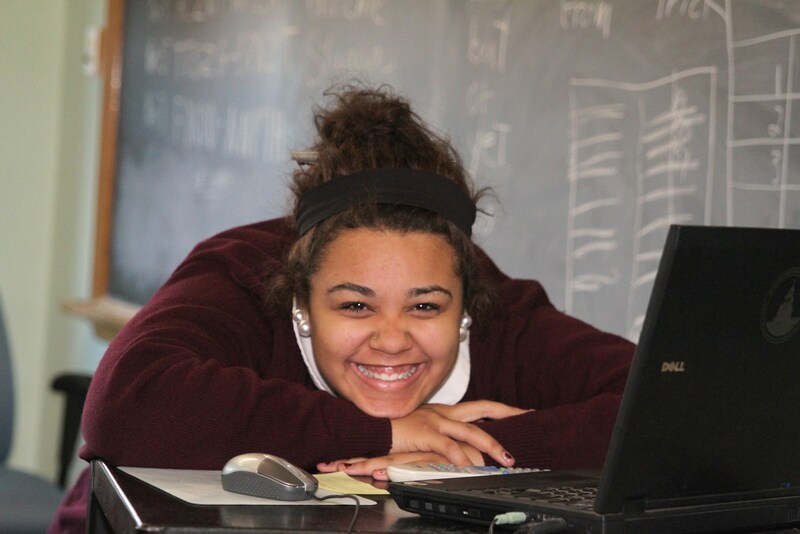 Our Shadow Program is open to eighth graders and transfer students beginning October 2nd. Seventh grade students are welcome to shadow beginning March 2019. Please print the Student Shadow Permission Form to the right. Complete and have your daughter bring with her on her Shadow day. You will receive a phone confirmation of your Shadow date. We limit the number of Shadow students to five visitors per day. Visitors should arrive to meet their Little Flower host student at 7:45 am (school begins at 8 am). Please arrive through our front entrance on Lycoming Street. Visitors should wear their school uniform. A lunch voucher will be provided to our visitors, but they are welcome to bring additional money if they choose. The Flossie Shop, the LF School Store, is open during lunch periods. It is the perfect time to buy your LF gear! Your daughter is welcome to take any of our SEPTA Tripper buses. The fare is $2.50. If your daughter will not be taking one of our SEPTA buses at dismissal, we recommend parents pick up their daughter at 2:39 from the parking lot entrance. For additional information, please contact Sister Ellen, Shadow Program coordinator at 215-455-6900x152. Our Open Houses are an opportunity for prospective students and their parents to come tour the school, meet our students, teachers and administrators, get your questions answered, and learn about how to apply for entrance and for financial aid. ...and much more! Check out the full list of events.